I found these eggs on my laundry floor and recently spotted cockroaches in my kitchen which is next to the laundry. 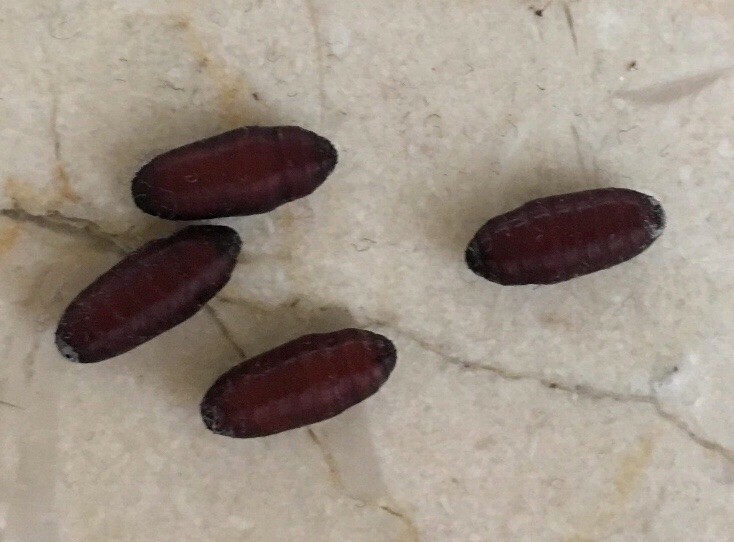 Are these cockroach egg sacs? When I lifted my green mop yesterday I found a whole bunch of eggs lying under it. What are these? They look like it. Vacuum up and get rid of the bag outside. If you have that many, it is time for an exterminator. At first glance it looked like mouse poop...until I did the zoom and saw the concentric rings...but in seeing those it appears they are the roach egg casings....see this link. If you want to try a homemade remedy before calling out the big guns, this site has a bunch. The one with Listerine (scroll down pretty far) is one of the best. Since you know you have roaches the best thing to do is find a safe solution (non-chemical if possible) and start working on eliminating them from your home as these are very nasty critters. Cleanliness is a first as these bugs love left overs (especially pet food) and anywhere that moisture accumulates. That mean kitchens, bathrooms and laundry rooms will be their most loved locations. They also love cardboard, brown paper bags, Styrofoam (especially Styrofoam found in faux plant holders), damp/wet clothes, shoes - did I leave anyplace out? You do not say if you live in a house or apartment but either way you need to make sure these critters have no holes to enter from outside. Check for places that a 2ply piece of paper can enter as that is all it takes. Seal them up if possible but if not then be sure to treat those places with your remedy of choice. Be sure there are no leaking faucets so check under kitchen and bathroom cabinets as well as fittings to washer. There are several good killers but each one will differ so be sure to read everything you can about each one before deciding what to use. Most solutions will take several days to a couple of weeks to completely eliminate your visitors. If there are children or pets around (even as visitors) do not use Boric Acid as this can be dangerous but is an excellent product if no pets or children are around. 20 Mule Team Borax is usually stated to be as effective as the more expensive boric acid but think long about this solution before using. Baking soda and sugar (regular white sugar or powdered) can be used and is not considered harmful to pets or children. This is a very good site with several suggested solutions but I love Diatomaceous Earth (food grade ONLY) as it is harmless and can be used anywhere (just don't throw it in the air as you do not want to breath it).